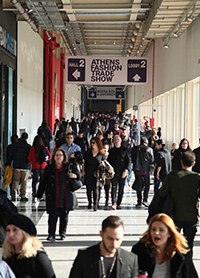 More than 1000 organised B2B meetings during the successful Athens Fashion Trade Show-January edition. The international character of Athens Fashion Trade Show was attested once more with great success during 25th and 28th of January 2019. Over 300 professional visitors from 32 countries (except Greece) have visited the fair. Representatives from prominent companies from Europe, Middle East, North Africa and beyond participated in the Hosted Buyers Programme creating a unique business experience. Over 75 international hosted buyers from 24 countries (Australia, Bulgaria, Canada, Finland, Ireland, Israel, Jordan, Kosovo, Kuwait, Lebanon, Malta, Palestine, Poland, Portugal, Qatar, Russia, Saudi Arabia, Spain, Sweden, Switzerland, Tunisia, Turkey, United Arab Emirates, United Kingdom) carried out more than 1000 organised B2B meetings with the exhibitors resulting in important business deals for the fashion industry. Next meeting point for all Greek and international professionals will be Athens Fashion Trade Show – September Edition which will take place on 20th-23rd of September 2019. The largest fashion trade fair in Southeast Europe and East Mediterranean will be again a celebration of world fashion and business. The biggest souvenir trade show of the world!